Faced with a threat half a world away, Tavara finds herself confronting an adversary that has even gotten the attention of Queen Victoria. 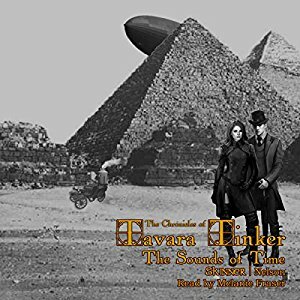 Tavara must race against the black airship to save the lives of countless innocent people, and Johnathan as well. This is a very exciting and fast paced story. I loved the opening scenes where Tavara has a meeting with the queen. I loved the whole idea of Tavara and her team having a secret mission to do for he queen and I can't wait to see what happens next. This is a short listen which means it is perfect for listening to in one go. Melanie Fraser consistently produces a high class performance. She brings a sophisticated voice to the story and is very easy to listen to. I enjoyed the accents and I particularly liked the sounds effects. They heightened the performance without being a distraction. In fact I found the effects to be quite helpful as the story itself is very fast paced and the sound effects helped me create a sharper image in my head. This book is quite short and so I would like to see any subsequent stories be a bit longer and maybe for the pace to slow down just a little bit so I can get to know the characters better. So much happens in this story and at such a fast pace it would be easy to miss something if you get distracted. I will enjoy listening to this book again! I received a copy in return for my honest review.